Well I am still Internetless so here’s another blog post from my trusty iPhone. I can’t believe it’s thursday already and I’m actually out in the real world working. It’s my first full work day so I’m pretty excited. These things are amazing. Not too bad calorie wise and whenever I need a sweet treat they’re only a few steps away. 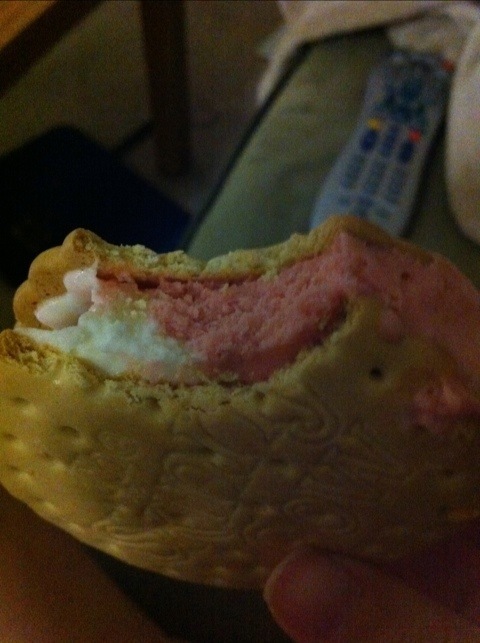 They have a mix of strawberry and vanilla ice cream between vanilla wafers. I’m not a huge chocolate person so they’re perfect for me. What’s the longest your Internet has been out? I’m really over it and will probably be calling the Internet company tomorrow! When I was in Europe I didn’t have internet really, but that wasn’t too bad. Growing up my parents refused to get wireless until I was in college so it sucked going through high school using dial up on their computer!! I am right there with you on the Strawberry skinnycow ice cream sandwiches. So good! the choc and mint are good as well.